Condor Outdoor Tactical Leg Holster | BUDK.com - Knives & Swords At The Lowest Prices! 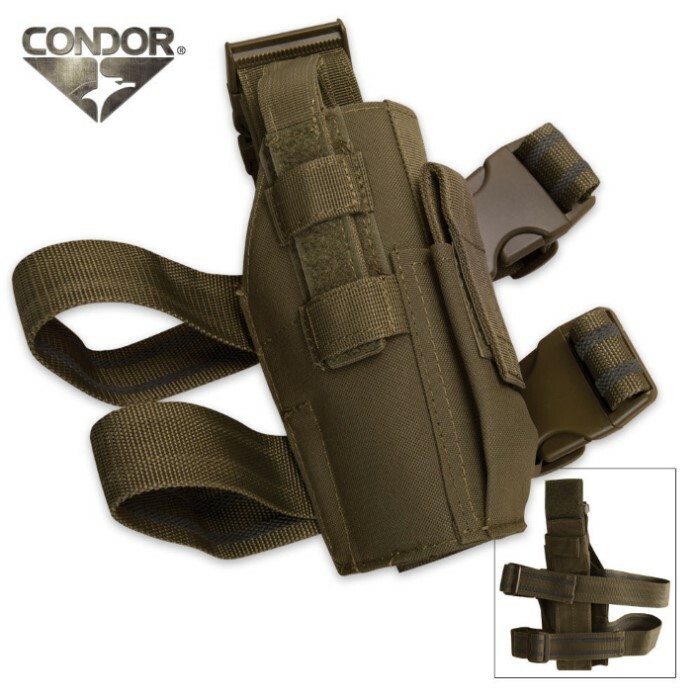 The tactical leg holster from Condor Outdoors features a fully adjustable retention system with a secure Velcro strap to secure your weapon. Other features include a non-slip rubber lining and a quick-release buckle for fast access. Designed for right side use, this tactical leg holster fits medium to large size handguns. The holster part of this rig is enormous. It absolutely swallows my Sig 2022. Construction-wise this holster is fairly well put together but it's too big for standard size pistols (Sigs, Glocks, etc.). This thing would be perfect for very large frame autos like a Desert Eagle .50 AE. I gave it 3 stars because it is pretty well put together (even though it's made in China) but it's just too large for all of my pistols.